Getting Around – Hello Korea ! This doesn’t quite capture how crowded the subways get around rush hour, because I’m too short to get the long view, but we are packed in like sardines. omg – you really must watch this video! It really is like this at rush hour! 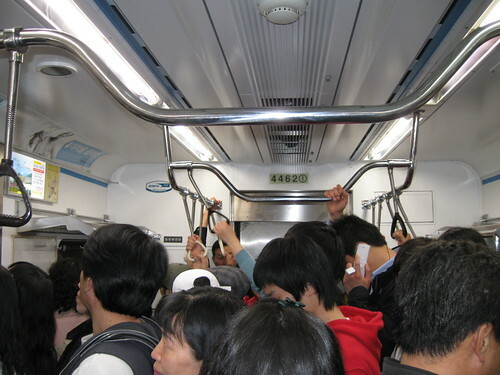 Not all the time, but rush hour – especially on line 2, the green inner circle line, is a teeming mass of humanity. The only time I’m afraid is going down the stairs – I’m paranoid someone will trip and there will be a pile-up. The trains come about every three minutes, there are up to sixty stops on each line, and there are ten subway lines (and two short express runs near the airport). I’m guessing about half of Seoul’s population of 11 million take the subways. It takes me an hour or more to get to the center of Seoul from where I live at Peyongchon Station. The green line doesn’t follow that generalization, because it is the inner circle line and makes a big loop. The lines are color coded, and they have painted stripes on the walls you can follow to get you to the next transfer point. You simply swipe your T-money card at the entry turnstiles, and then clear them by swiping again at the exit turnstiles. Trains are announced according to their final destination, so you should try and look where the line ends. Some trains only go half way, so if you are going further it’s better to wait than get on. You don’t have to go back through the turnstiles when you transfer most of the time. I have had to do this twice though. Not sure if it has anything to do with there being two different companies running different portions of the subways or not. If you’re already on a subway platform and not sure if you’re heading the right direction, check on the columns or walls for signs like above. Check against your map and you’ll see if you’re heading in the right direction or not. If you’re not, then you’ll have to go up and over to get to the platform going the opposite direction. It’s a brilliantly laid out system, with excellent way-finding 99% of the time, but I REALLY WISH they had labeled the platforms as A, B, C, or D instead of 1,2,3,4. Some confusion can result if, for example, you are riding line 1, and the train you want is on platform 2…Therefore, you have to find a second and third way to make sure before you get on the wrong train. wow , less lines than in Paris but much longer … I am wondering if they have more stops ? It says that the Paris Metro “has 16 lines, mostly underground, and a total length of 214 km (133 mi). There are 300 stations. Since some are served by several lines, there are 384 stops in total. Seoul has 380 stations, but they’re adding a new line and extending another line by 2010, so that will increase. Both Paris and Seoul are mostly underground, but the Tokyo systems is about half above ground. And the actual usage is hard to calculate because Seoul has three different companies running their subways, while Tokyo system has two totally separate systems. So if you cross systems you are counted twice, whereas in the Seoul lines you don’t go through the turnstiles again when crossing systems and are only counted once. You’re such a geek, Pierre! They seem fixed to me. The heat vents are under the seats, so the seats are warm in the winter, which is very nice. nope. no folding seats. although sometimes there are areas with no seats for the handicapped. I like the photos of the stations for the new lines – very cool!